I feel I owe my readers this announcement. It is, perhaps, very late, but one which is a necessity. As you may have guessed, there will no longer be regular updates for this story. As suggested in the introduction to this story, consistency is not something I can guarantee with my writing here due to an insanely erratic work schedule in my own life. I enjoyed every single update I have written, and I still have a few pre-written which I will post at some stage, but I can no longer write 40+ updates per season. In-game, I'm currently approaching the end of the year 2028. A long way away from where the story is. When I feel the time is right, I will post season reviews here of what has happened. They will be quite lengthy posts, which I am sure you are familiar with if you have followed my writing for any length of time. I do, however, wish to do some other writing here. It'll be more relaxed and, for the first time in years, it'll be based on a second save of mine for FM. It'll be for a team who plays a shorter season than what English football offers and somewhere I feel at home. For that, we shall return to the eccentric land of Finland. Hopefully Jack won't mind too much, but the land of a thousand lakes is calling out for me to return there. For those who have followed my writing previously, I have ventured there with four teams previously; FC Viikingit, JJK, SalPa and FC Honka. I am, currently, undecided as to who I will be managing in the country but it is a league structure I truly enjoy. I apologise to the readers who have enjoyed this current story but it is no longer something I can sustain writing. While I (somewhat) enjoy the playing of the save, it is all too similar to the many English LLM saves I have done previously, of which there were many. Thank you to everybody for following me so far. I hope some of you may follow my next adventure (coming soon) and I hope that there may be some new writers coming to share their adventures here soon too. I mean, considering I sort of own Finland at this moment I'll be having words to the immigration office about your arrival. This is a shame, as I have enjoyed this journey. But, you must do what you have to do and I can't wait to read of your tales in Finland, as much as it will upset Jack. 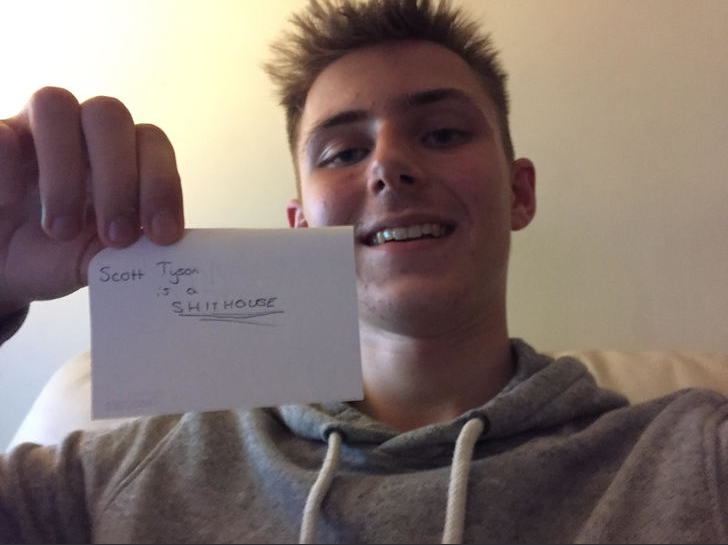 Terrific content all the way through Justice, hope you enjoy your next challenge! National League and FA Trophy champions Oxford City have revealed their new kits for the upcoming 2020/2021 season. Manufactured by Macron, the home and away kits will represent kit sponsor University of Oxford, who have extended their deal with the football club. The home kit design has moved away from the traditional blue and white hoops, instead offering a full-blue colour, with black and white details on the peripheries. The sponsors are coloured in black, which has received somewhat of a backlash on social media. The away kit has received a much more generous welcome from the public. Oxford City will kit out for away games in black and grey hoops, with deep-red details marking the jersey. 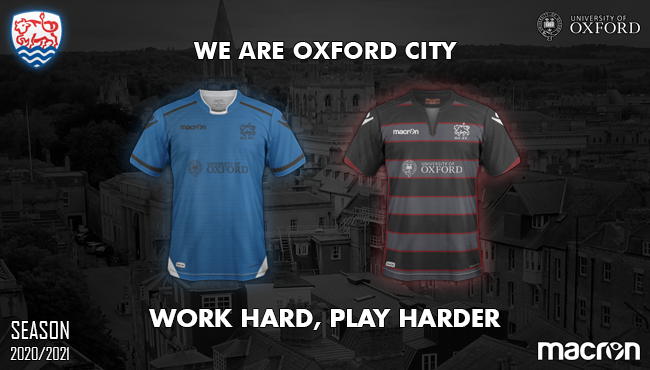 Oxford City's kit campaign slogan this year is 'Work Hard, Play Harder', placing emphasis on how people are rewarded for their efforts ad should celebrate what they earn. The public response has been mixed. While most fans do not mind the switch from the traditional blue and white hoops, they have voiced their displeasure over the colour of the logos of their new home kit, which they say may be difficult to see. However, there has been an overwhelming euphoria surrounding the away kit. @JackLeedsFan: Does it come in a XXXXS? Asking for a friend. Big Griff: Can't wait to see my heroes dress up in their new attire. Little Griff: Is that red or pink? ScottLovesToes:Disappointed to not have Gucci manufacture them. ScottT, this tale is not dead and buried yet! Lovely kits, did you put them together? It was one of Jay Spearing's typically enthusiastic and optimistic comments. It followed a rather impressive training ground display from the industrious midfield engine ahead of our replay against Reading in the FA Cup. Despite being incredibly short for his profession, Jay was a bucket of energy and desire on the training ground, looking to work his way into more regular first-team football. Spirits were somewhat low in the Liverpool camp. A mixed set of results in the Premier League had left Liverpool behind in the race for the top four spots, with the club dejected following an avoidable title-race loss at the hands of bitter rivals Manchester United in the previous season. The mood was not buoyed by a Champions League group stage exit this term. The club had been left dejected following another failed league title bid, and what followed in the summer. Gone were Xabi Alonso and Sami Hyypiä, two players forever in the hearts of all those associated with the club. Arbeloa departed too. The departures left a major hole in the team's starting lineup and in the dressing room. Rafa Benítez attempted to replace those he lost. In came creative midfielder Alberto Aquilani, Il Principe was his nickname in Italy, England full-back Glen Johnson and Greek defender Sotiris Kyrgiakos. The first struggled with injuries throughout his first months of the campaign, the second hit incredible form early on in his Liverpool career but was all too injury-prone to be considered reliable and the third was no more than cover for the first team. 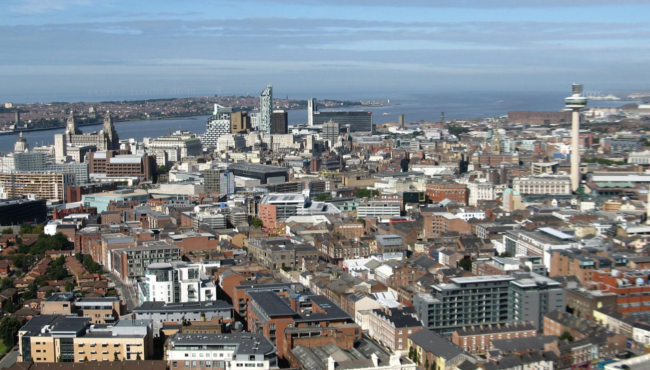 The Kopites looked towards Liverpool's famous academy for a budding star to fill the gaps left. It had been too long since a star was born at the doorstep of Anfield. Many had come, tried and failed to make the impact that fans were looking for. Steven Gerrard was edging towards his twilight years and Jamie Carragher wasn't getting any younger either, fans were becoming anxious over the prospect of not having a fellow Liverpudlian step in to join them. There were a few of us who the fans had rested their hopes on. Jay Spearing and Stephen Darby were players who the fans had time for. They weren't the most gifted players but he showed heart. However, at twenty-one years old they required a miracle improvement to be considered as long-term players for the club. Martin Kelly was a player the fans were excited about. A giant of a man and built like a brick shithouse, Kelly was the perfect candidate to fit in as a no-nonsense defender for the club. He impressed in his early games for the senior side but was out of action with a groin injury, when he could be supplementing the first team at the age of nineteen. The fans had other hopes too. Jack Robinson, at sixteen years of age, was making all the right noises in the youth sides and for the reserves. He was expected to fill the void left by John Arne Riise who left the club back in 2008. An English left back, such as Jack Robinson, was considered to be the club's remedy for many defensive problems faced in recent years. There was also Nathan Eccleston, a teenage striker renowned for his explosive pace and directness in attack. There was also myself. At nineteen, I had been training regularly with the senior squad and I was set to make my senior debut in the FA Cup replay against Reading. I mostly played in midfield but Rafa had given me the nod to make my first Liverpool start at right back, alongside Carragher, Agger and Insúa. Rafa's analysis of Reading rang through my head as we left Melwood the day before the big game. Martin, who hadn't been training due to injury, was the designated driver for us local lads. Jay was passenger seat, leaving Stephen and myself in the back. We were all pumped for the game, seeing the FA Cup as the perfect competition for us to show our worth. We all grinned as Spearing proclaimed his belief in our trophy-winning credentials. He was the most outspoken of the four of us, which was saying something. Scousers aren't typically the quietest bunch but Jay's voice was the one heard over the rest, most of the time. 'You'll have the birds following you on a leash after you play tomorrow Fergie,' Jay exclaimed with a grin which took up his entire face. I could see him winking at me in the rear view mirror as he giggled at the thought. We were just a bunch of young Liverpool lads enjoying being part of our childhood club. It had become a routine for us to go for a group excursion to a coffee shop in the city centre after each training session, still dressed in our club gear. We were known well enough for some to take notice of us but not enough to be the centre of attention wherever we went. We joked and laughed during the short trip to the city centre, where Martin parked in a side alley near a local Starbucks which we frequented regularly. We were the loudest group in the entire city as the four of us marched towards the coffee shop, in a two-by-two formation. The two slightly older lads, Stephen and Jay, lead the way as Martin and I followed closely. As we stopped to turn into Starbucks, I found myself knocked off the footpath and onto the adjoining road. I had been struck by a fast-paced cyclist on a bike, with his hood up and barking abuse at me as he cycled away. It was just a rough local lad showing ignorance to all others. My hands were stinging as they were skinned by the tarmac but before I could get back up I was sent flying once more. My entire world was sent into slow motion as I landed on the kerb, blocking my fall with my two arms. My momentum meant I couldn't stop my head from slapping off the ground, leaving me dazed and with a buzz in my ears. I realised that within a matter of seconds, I had been knocked by a cyclist in front of a moving car. The car had struck my leg but it had not yet occurred to me that I may have suffered bodily harm. I put a hand to my head to find blood pumping from a graze in my scalp. A bruise had begun to swell significantly underneath my fingertips. I looked up from the ground at Jay, Stephen and Martin who rushed over to me with looks of horror painted over their faces. That was when I noticed the pain. It hit me like a hot lightning bolt surging through my body. I was in agony. Where was it coming from? My brain went into overdrive in an attempt to locate the source of the pain. It was my left leg. Why was it sore? The car had hit it. There were broken bones. There were torn muscles. There was other damage. I risked a glance. It was bad. My ankle was completely misplaced. The lads attempted to comfort me as I unwillingly produced a blood-curdling scream. I was seeing red. Stephen was on the phone to emergency services, panic was in his voice. Jay kept trying to calm me down. I wished for him to shut up. There was no way I'd calm down. As the soon-arriving ambulance took me away, all I could think about was my future in a Liverpool shirt. I went from being certain to make my Liverpool debut in the FA Cup in front of the Kop to not knowing if I had a future in football. Was it over before it began? Was this to be my legacy? Was I to be just another sad story? What a f*cking update. Honestly, you and Jack are a credit to this site. This is the sort of stuff I love to read. I feel like this is adding to the ‘story’ part of this particular story massively. However, massively disappointed in your emasculating of myself via a Twitter comment. Very rude.